Has the Digital Era Made Business Owners Less Concerned About Physical Security? - Close Circuit Security Organisation Ltd.
There’s no doubt that cybersecurity is a growing concern, but with such a large emphasis on keeping data safe, has physical security become less of a concern to business owners? We’re currently in the digital era where technology continues to evolve and become more influential in the way we do things. Nearly every industry you can think of has become more efficient due to the breakthroughs of modern tech, and many industries wouldn’t exist at all without it. Cybercrime is becoming more and more of a threat to businesses, and with so much focus on preventing it, physical security may be becoming a secondary concern to business owners. There’s no doubt that cybersecurity is something that all businesses should be taking seriously, but it becomes less of a concern if your poor physical security allowed intruders to break in and steal your computers. Without a secure business property, you will be an easy target for burglary and vandalism, both of which can have massive effects on your operation. Theft of equipment will prevent you and your staff from working, and therefore cause losses in profit. Vandalism to your property will be costly to repair, and depending on the severity it may prevent you from running your business until the damage is fixed. Physical security doesn’t have to be expensive, and your business won’t need to be Fort Knox. Some simple additions to your property or services provided by professionals could be all you need to keep your business safe. Both cyber and physical security have individual advantages to a business owner. There are certain types of physical-security that would be massively improved by the addition of some technology-based security. An example of this is door/gate access. 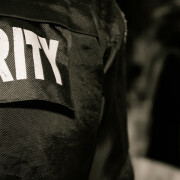 If a business has a database of all their employees set up and available to security guards then it not only makes it easier to monitor who is coming and going, but it also gives you a better chance of keeping out anyone who doesn’t have access. If you require more advanced security then you could implement a keycard and photo ID system, the keycard would gain you access to the building and the photo ID would have to be shown to a security guard. It’s often the case that companies have two separate security teams. One team of IT specialists to prevent anyone breaking through your firewall and stealing important data, and the other to prevent intruders breaking through your window and stealing your equipment. The integration of both cyber and physical security is the key to getting the most out of the advantages offered by both. Another way physical security proves to be effective when you consider computer-based aspects of your business, is the variety of ways you can set up physical defences to protect your data. If your business deals with a lot of data and requires separate rooms for servers, or even if you have areas needing a higher level of security. It will give you peace of mind knowing that any areas containing expensive equipment or irreplaceable materials are secure. Whether it’s by installing a number of interior locks to make sure that each and every separate area is secure, or by placing security guards in areas you feel your business is particularly vulnerable. It’s pretty safe to say that both cyber and physical security should be considered as a priority, a high-quality firewall is great, but it’s a little bit pointless if you’re poor security is basically inviting burglars to rob your premises. As technology continues to improve there are possibilities to make all types of security more effective, and therefore bridging the gap between cyber and physical security. For information on the range of services we offer, or if you have an enquiries then don’t hesitate to contact us by phone on 0203 246 0094 or email: office@closecircuit.co.uk.